The Belimo Characterized Control Valve (CCV) marks a true advancement in control valves. CCV?s combine the high close-off capabilities of a ball valve with a specialized disc that ensures a true equal percentage ?ow characteristic. 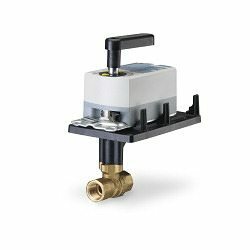 Belimo Characterized Control Valves are available with spring return and non-spring return actuators. They can be used in various building controls applications involing air handlers, heating and cooling coils, fan coil units, unit ventilators, and VAV re-heat coils.